Today, after an unsatisfying trip to the tar pits with Happy Meal (age 7), I decided to perk him up with a trip to a burger stand. Note: the tar pits are pretty GD uninteresting to 7-year olds--now you know. How could I go wrong? 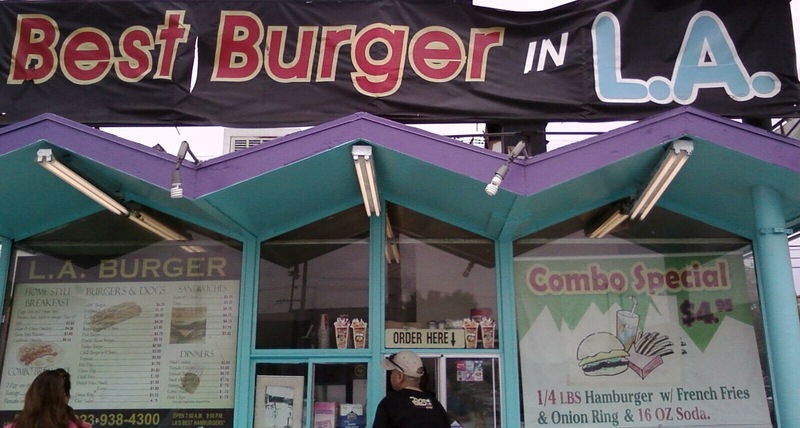 The sign clearly stated that this was LA's best hamburger. A total no lose situation. We placed our order, and after an undue amount of negotiation and back and forth to get the order straight, we sat at the counter and watched the process. 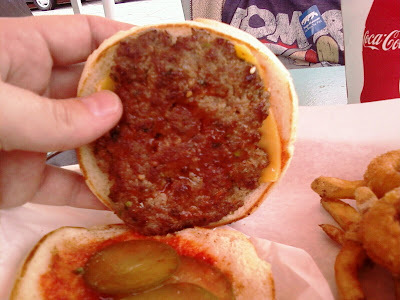 The meat was in a tub, and they formed the patties by extracting a wad of a ground beef blend, making a ball, and smashing it flat on a seasoned griddle. This imparted an even and deep sear to the burger. The cheese was tossed on when the burger hit the toasted, sesame seeded bun, and it melted just fine. They did not season the meat when it was cooking. The beef blend was pre-seasoned, and there was a fair amount of greenery in there. They also used some sort of bread in the mix as filler, so the mix of spices, bread, and ground beef was not unlike a well-seasoned meatloaf patty on a toasted bun. The texture was a little gummy, since the bread in the mix got saturated as the burger cooked, but this made it juicier without being greasy. Frankly, this was a pretty good burger. The lad was not pleased with it, but he did discover that he really liked the rings there. Also, the fries were hand cut and pretty good. Burger Review: By no means was this the Best burger in LA, but it was a great deal for 5 bucks, and a decent burger--I'm coming back with some friends to double check on this one.